Despite his many contribution to Old Testament scholarship, there are several elements of John Goldingay hermeneutical approach that should concern committed evangelicals. Now that six key features of his hermeneutical framework have been identified, an evaluation of his hermeneutic may be attempted. In this section, four key issues with Goldingay’s hermetic will be taken up. These are issues that arise directly from one or more of the six key features developed about. Moreover, the issues addressed in this section should be of great concern for evangelicals. The first key issue with Goldingay’s hermeneutical framework that evangelicals should take note of is his use of the New Testament. Goldingay uses the New Testament, as stated above, to illuminate the Old Testament. Likewise, it was noted above that Goldingay then claims that these newly illumined truths in the Old Testament are, in fact, inherent in the Old Testament. This conclusion may be proven easily through the use of two examples. Thus, Goldingay sees a parallel between the Old and the New Testaments’ uses of anthropomorphic language and references to the Holy Spirit. Since, for Goldingay, the two testaments illuminate each other, he is able to bring clarity to the Old Testament by the comparative clarity of the New Testament. Goldingay concludes that the fruit of the Spirit, although revealed in the New Testament are present in the Old Testament. The fruit of the indwelling Holy Spirit, then, is nothing new; this was a ministry of the Spirit in the Old Testament. In fact, this truth is inherent in the Old Testament, but only the New Testament interpreter of Scripture is able to see these truths. This approach to Old Testament interpretation is a direct result of Goldingay’s conviction that the New Testament illuminates the Old. This illumination reveals, for Goldingay, that truths that were previously hidden in the Old Testament are, in fact, inherent in it. As a result of this method, he no longer needs the New Testament. In the case of the Holy Spirit, since the truths about the Spirit’s ministry are inherent in the Old Testament, the New Testament is no longer needed to add anything new. It is Goldingay’s ultimate dismissal of the New Testament that must now be taken up. John Goldingay, “Was the Holy Spirit Active in the Old Testament?” ExAud 12 (1996), 18. This experience was a huge blessing and a great joy. I will always look back on this experience with fondness and gratitude. My Seminary was selected to participate in the IGNTP in cooperation with the GSI! STS is pleased to have been chosen as one of five schools participating in a pilot program launched by the Green Scholars Initiative (GSI) to facilitate American student participation in the International Greek New Testament Project (IGNTP). The goal of the IGNTP is to produce a comprehensive critical apparatus of the Greek New Testament; as such STS M.Div. 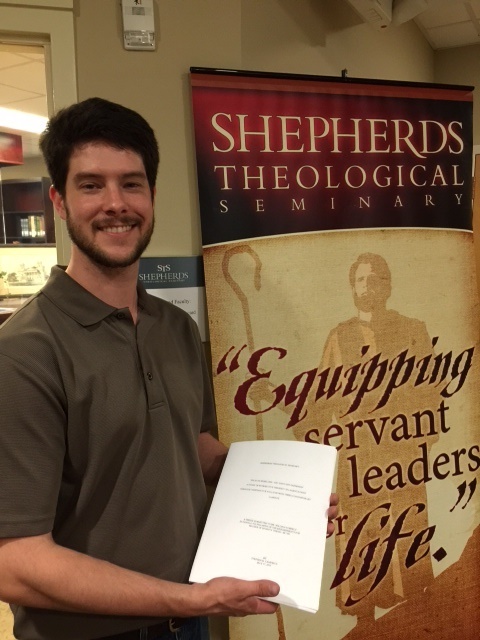 students Mike Egerdahl and Denis Salgado have started transcribing manuscripts of 1 Timothy to contribute to this massive scholarly undertaking. To participate in the program, students with facility in biblical Greek must acquire skill at reading Greek minuscule (pictured below), the form of writing used in most manuscripts of 1 Timothy. Students use manuscript images and data provided by the Institute for New Testament Textual Research (Institut für neutestamentliche Textforschung) in Münster, work locally with Dr. Andrew Smith, a STS faculty member skilled in manuscript studies, and participate in webinars with internationally renowned textual critics. This pilot presents STS students with a wonderful opportunity to engage in world-class biblical research and cooperate with an international community of scholars. To learn more about the fantastic opportunities provided to students through the Green Scholars Initiative, follow this link.To learn about the Editio Critica Maior project of the IGNTP, follow this link. And to explore the research of the Institute for New Testament Textual Research, visit this site.